...it was the worst place we've EVER stayed, and we've stayed in a whole lotta airbnbs. It was also the most expensive place we've ever stayed, go figure. Anyway. Moving on. We didn't want to be in the apartment a second longer than we had to, so even though we were already tired from our earlier activities and drive, we headed out (and actually locked ourselves out of the apartment. It was just one of those days). After a few plans of something to see/do didn't pan out, we ended up driving into Killarney proper to walk around and see the sights. One of the main drags through town. 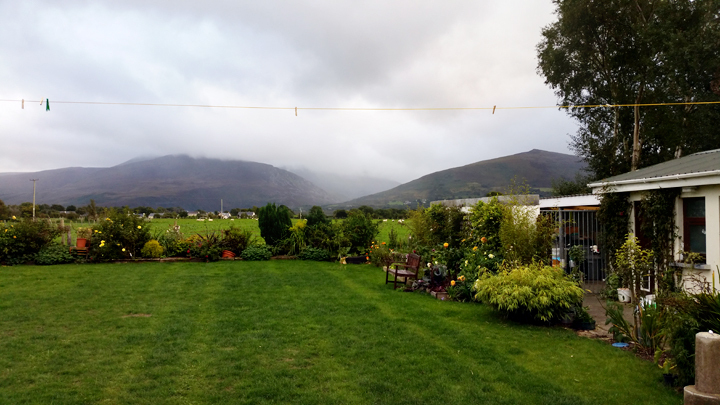 Our family in Killarney, Ireland on Saturday September 19th 2015. 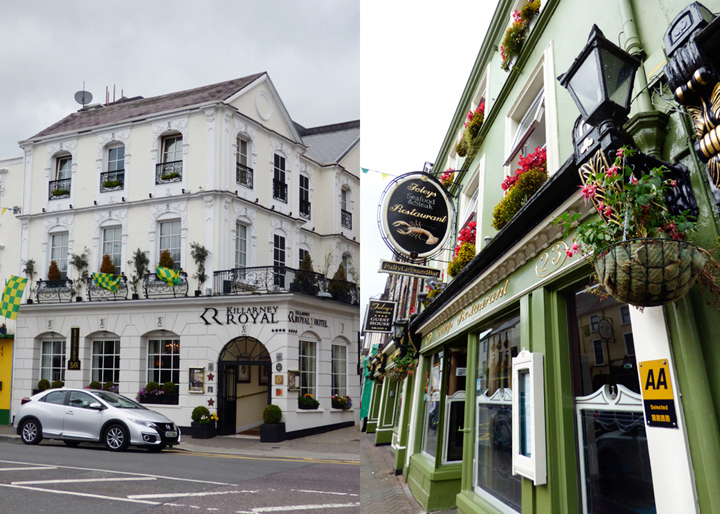 The Gaelic football All-Ireland Championship was being played soon against County Kerry and Dublin, thus all the towns here including Killarney had their Kerry colors flying. Flower boxes. I can never get enough of them. We stopped at Subway for dinner since the kids will usually eat a little sandwich. They had masks from the new Hotel Transylvania movie for the kids. Hysterical. We had a nice afternoon and into the evening of strolling the town, stopping in some stores, getting local ice cream, and enjoying the ambiance. We saw the elegant Neo-Gothic Church on our way back to the car and that concluded our time in Killarney. Coming up next on our Ireland recaps: the Dingle Peninsula! That was a fun afternoon/evening! Bummer about the place you stayed! But beautiful little town! LOVING that mask from HT2!!!! Bummer about your airbnb... I seriously love the green. I can't get enough of it (that goes for me living in Utah...). How charming! It's too bad about the accommodation, although it doesn't surprise me. AirBNR can be a hit and miss, right? Hope this doesn't happen often. Thanks for the virtual tour!